W.O. Cape South Coast – grapes from Elgin, Bot River, Elim and Napier. Includes 10% Semillon. Flavour descriptor as tasting note a bit inadequate here – there’s plenty going on (citrus through peach to tropical fruit plus a pleasant herbal overlay) but what is particularly striking about this wine is the concentration and texture. Rich and creamy but not unctuous thanks to tangy acidity. Nicely savoury on the finish. 90% Shiraz from the Walker Bay (65%) and Elim (35%) areas as well as 10% Viognier from Franschhoek. Matured for 14 months in 300-litre French oak barrels, 70% new, before blending and put back into barrel for another 4 months. The wine shows red and black berries, apricot (!) and white pepper. It’s medium bodied with fresh acidity and fine-grained tannins. 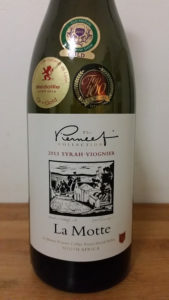 The model is obviously Côte-Rôtie and this vintage is arguably the closest that the La Motte team have come to emulating the famous Rhône appellation – very sophisticated.